Measles is a highly contagious, vaccine-preventable disease. Although it is usually considered a childhood disease, it can be contracted at any age. Generally, preschool children, adolescents and inadequately immunized individuals comprise the majority of measles cases in the United States. Within 3 to 5 days, a rash often develops on the face and neck, and can spread to the rest of the body. How can people prevent catching measles? The best way to prevent measles is to get vaccinated. 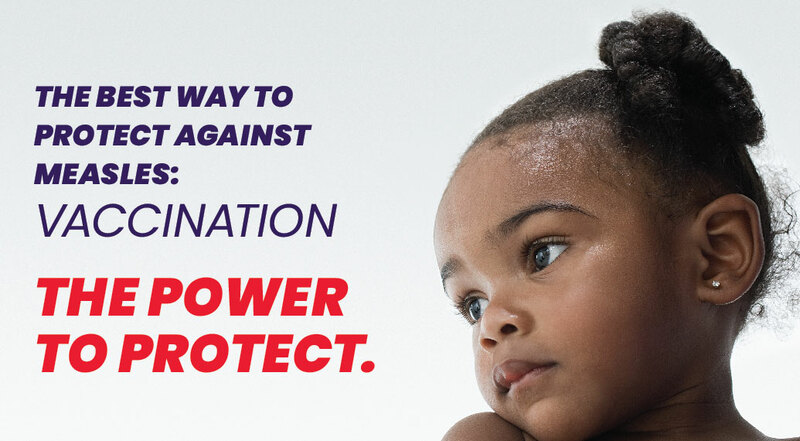 Health care providers and county health departments offer the MMR vaccine, which prevents measles, mumps and rubella. What are the possible health complications from measles? Anyone can get measles: children under 5 years old and adults over 20 years old are more likely to suffer complications from measles. Ear infections occur in about 1 in 10 children who catch measles. Permanent hearing loss is possible. Diarrhea occurs in about 1 in 10 people who catch measles. Pneumonia occurs in about 1 in 20 children who catch measles. Pneumonia is the most common cause of death from measles in young children. Encephalitis (swelling of the brain) occurs in about 1 in 1,000 children who catch measles. Encephalitis can lead to convulsions, deafness or intellectual disabilities. Death occurs in about 1 or 2 out of 1,000 children who catch measles. Pregnant women who catch measles are at risk of premature birth or have a low-birth-weight baby. People with compromised immune systems, such as from leukemia and HIV infection, may be especially at risk for measles complications. People who are unvaccinated or inadequately vaccinated for measles. People who traveled to international and domestic geographic regions with ongoing measles outbreaks. People who have been exposed to someone with measles. What should I do if I think my child or a loved one may have measles? First, call your health care provider, facility or county health department and let them know your concerns. DO NOT go directly to your health care provider’s office or facility, or the county health department. A health care provider or a county health department official will give you instructions on getting seen in a timely manner, and how you can avoid exposing other people to measles. In March 2019, 1 measles case was reported. Fewer than 10 cases were reported each year from 2013 to 2017, and a total of 15 cases were reported in 2018. So far in 2019, one Florida resident has spent time in Florida while infectious. Vaccination is the best way to prevent measles infections. In March, the case was not known to be vaccinated against measles. Due to generally high vaccination rates, measles in Florida is rare but occurs every year and is most often associated with international travel. So far in 2019, the one confirmed case had recent international travel to the Philippines. A total of 138 people who had possible exposure to the measles case have been identified during this ongoing investigation. There were 2 main exposure settings, with the most contacts identified in health care settings. Even though measles has been eliminated in the United States since 2000, cases occur every year, mostly among unvaccinated individuals. As of March 28, 387 confirmed cases of measles have been reported by 15 states and the District of Columbia in 2019. The 2-dose measles vaccination schedule has been successful at decreasing cases. Recently, increased measles activity has been reported all over the world. The Centers for Disease Control and Prevention (CDC) issued a Level 1 Travel Alert for several countries with measles outbreaks, including the Philippines. Travelers to these countries should make sure they are vaccinated against measles with the MMR (measles, mumps, and rubella) vaccine. For more information, please visit CDC's Travel Health Notices webpage.